Well, that was wrong; but not as much as you might think. Bibi lectured and bossed around Obama. So far, the President has just sat there and taken it. As MJ Rosenberg pointed out in his Friday column, a lot of this anger is contrived, and geared toward attaining a political goal. We need to understand what that goal is and what Netanyahu’s reprehensible hubris on Friday after meeting with the President of the United States, was meant to achieve. We can start with a basic fact: this tumult is not really about Obama’s statement regarding the 1967 borders. This is a contrived controversy, based, to begin with, on a willful distortion of what Obama said. The President did not call for a return to the 1967 borders. He merely stated what is obvious, what has been American de facto policy all along and the fundamental truth of any two-state solution: that negotiations must start with the 1967 borders, and whatever modifications may be agreed to start from there. So, what was the purpose of this intentional distortion and elaborate theater by Netanyahu, one which was subsequently lauded and backed by the ultra-right wing Israeli cabinet and a drove of Members of Congress from both sides of the aisle? In fact, it was a bold, albeit clumsy, gambit by Netanyahu to rework the entire framework of what is generally understood to be the framework for negotiations. My latest piece for IPS News is up. 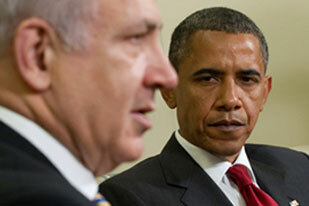 It looks at the meeting today between Benjamin Netanyahu and Barack Obama and the fallout from it.